Seems "air plants" or Bromeliad Tillandsia are all the rage. 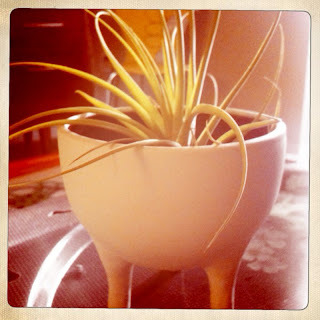 I bought some small versions of the plant at Sanctuary, but recently saw large, decently priced air plants at Loft. No doubt I love the simplicity of them and the no gnats part. This photo was taken with my iPhone Hipstamatic application, which I am going all kinds of crazy over.